Ability to import data using MS Excel; If you have an excel document with your current inventory of applications, servers, business capabilities etc. you can now upload these from the Architecture Portfolio section. We have started the roll-out of our new customer support platform with live-chat support. While you are using our product and have some questions around certain features or how-to-do things you can now talk to one of our expert online agents. General enhancements to the visual models of Views & Models and Architecture Portfolio features like ability to add relationships directly inside the Architecture Portfolio as well as navigational improvements (able added search functionality, able to handle thousands of servers and hundreds of applications). Our next release 2.9 will expand on the MS Excel and add Excel exports to the Architecture Portfolio. Both from exporting an inventory but also exporting matrices. This was originally intended to be included in version 2.8 but we opted to swap this for the Live Support feature instead. 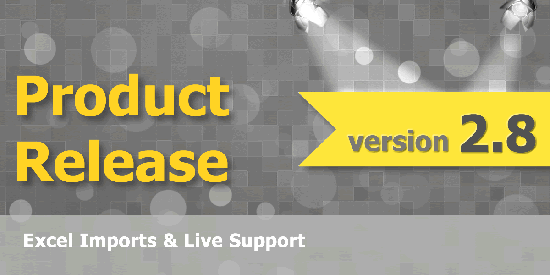 keywords: release 2.8, enterprise architecture software.